Traveling can be stressful, even for the most organized vacationer. Whether you’re an experienced explorer or touring novice, there are hundreds of apps that will help any trip go off without a hitch. Here are our top seven best iPhone travel apps. Bon Voyage! Kayak is by far the best app to use when you’re searching for the cheapest flight or hotel room. Not only does Kayak compare prices from the airlines and hotels themselves, but they compare the prices offered bytravel sites like Expedia and Orbitz, all to find you the lowest prices out there. 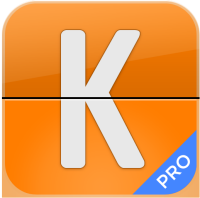 With Kayak, you can also compare, book, and manage your trip itinerary. The Pro version offers an ad free experience along with terminal maps of over 100 airports so you’re never lost looking for your gate. Making international calls can be pricey. 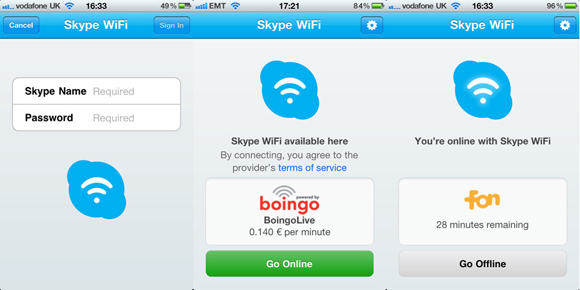 Skype WiFi is made for international calls and uses Wi-Fi hotspots to keep the cost down. This app is easy to use, especially for those already familiar with Skype, and will help travelers stay in-touch with family, friends and co-workers while on the go. Just be aware of hidden Wi-Fi fees at certain locations. When road tripping through the United States or Canada, Cheap Gas! will locate the lowest priced gasoline in the area. 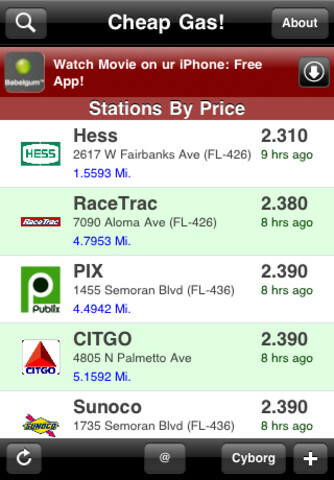 The app goes through GasBuddy.com and uses the iPhone’s GPS to list prices of every grade of gas. For planning ahead, the app can search using a zip code too. The app is quick and easy to use; however, a couple bugs are still being worked out of the system. HearPlanet is a fun app for history nerds and fact lovers. The app uses geo-locators to pinpoint your location and then offers audio recordings of information about that area and the landmarks around it. Using sites like Wikipedia for information, the app acts as a tour guide for your trip. If you are the one taking friends around town, impress them with your knowledge of the area with little-known facts about your hometown. This app is great to listen to on a road trip and also has a “postcard” feature that allows users to send pictures to friends and family. This mapping app locates whatever you need by using your current location. Gas stations, hospitals, coffee shops and taxi services are just a few examples of easy to access services that AroundMe can locate. This app is great for tourists looking for something to do or if you have an emergency in an unfamiliar city. Some users have complained about the accuracy, but it generally seems to be on target. Frommer’s offers a global tipping guide and calculator, preset and customizable packing lists, a currency and weight converter, and a global clock among other tools that every globetrotter should have handy. You might want to wait for the next update to download this app, however, because there are some bugs that need to be fixed in the current version. Release some airport anxiety with Next Flight by your side. This app’s database holds flights for the current day and following two days for all airline carriers. The app looks for flight status updates, arrival and departure times, and the terminal and gate info so there is no more scouring the airport for monitors. The catch? The app only displays non-stop flights between destinations. Thanks Nikhil for shearing your views. I’m truly surprised to here from you that types of apps. Skype is also a attractive voice over IP. Thanks again.